I have a confession to make. 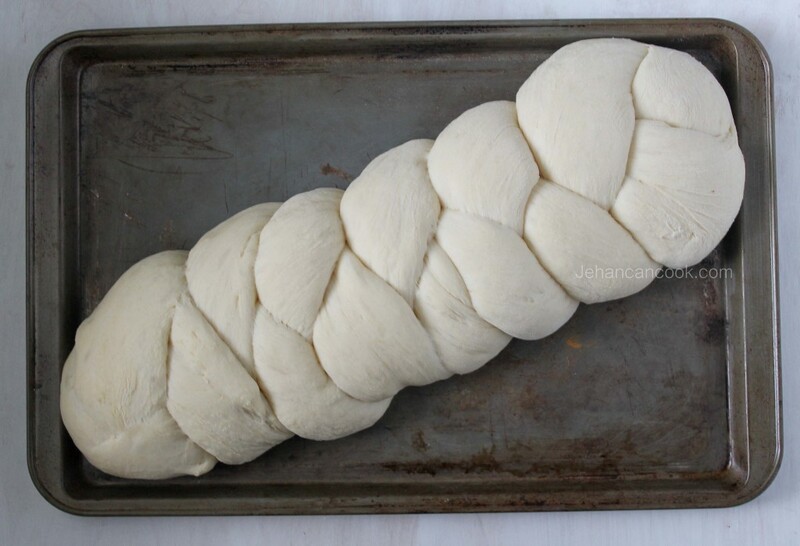 I’ve had this perfect recipe for Guyanese Plait Bread for quite some time. In my defense I did test it quite a few times to make sure that I was sharing the perfect recipe, and that it is. First, let me just say that there is nothing better than freshly baked bread—with butter. Between the three of us we devour a loaf within 24 hours. It’s just that good. Simply put, Guyanese plait bread is white bread that isn’t too light or too dense. It’s sturdy enough to dipping in warm stews such as Pepperpot. Honestly, I wish I would bake fresh bread more often but let’s face it, with the busy lives that we all lead that’s just not possible. Having said that, make this bread! You won’t regret it. In a large bowl place warm water and sugar, then sprinkle yeast on to water and let sit for 10 minutes to allow the yeast to proof. 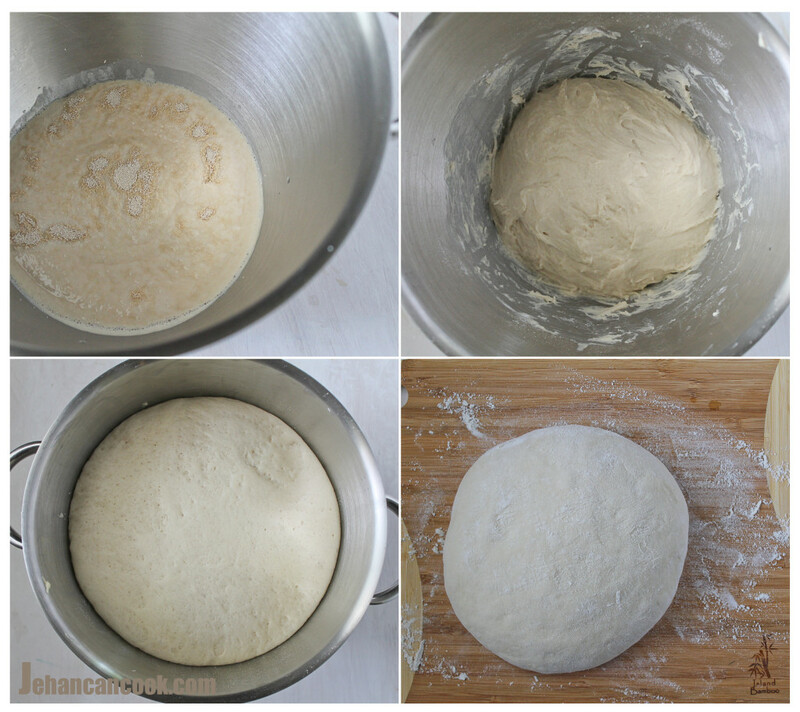 Add flour, melted butter and salt in the mixture with the yeast and mix to form a dough. The dough will be sticky. Add just enough flour (about 2 tablespoon) and knead for 5 to 10 minutes. A stand up mixer with the dough hook attachment would be an excellent alternative to hand kneading the dough. Cover bowl with a cloth then set in a warm place and allow to rise for 45 minutes. After 45 minutes, remove the dough from the bowl and place on a lightly floured surface. Knead for 2 minutes to form a smooth ball, this shouldn’t take long. Next cut the dough into 3 even pieces then roll each piece into equal logs about 14 inches. Braid the 3 logs to form the loaf. Make sure both ends are secure by pressing them together firmly then tucking under. Let rise for 30 minutes in a warm place. On the cook top of the preheated oven would be perfect. Place in preheated oven and bake for 30 minutes. Remove from oven and immediately brush with melted bread then allow to cool; then place in a bag and seal to store for up to 5 days. Looking at this bread makes me crave pepperpot. Is it ok to use this recipe to make salara? Bishnu, I actually have a recipe for salara thats on the blog that I think would be better suited. Wow Chanceyc that was quick! Glad you enjoyed it. Looks yummy! I will try it!! I am also looking for a Butterflap and Tennis Roll recipe. Love the new blog look! Who doesn’t enjoy a batch of homemade bread? It feels like such a time consuming thing, but when you eat a slice or seven, you wonder why you don’t do it more often! Thanks Duo Dishes. It can be time consuming but so worth the effort! hello there I found this recipe via Pinterest. 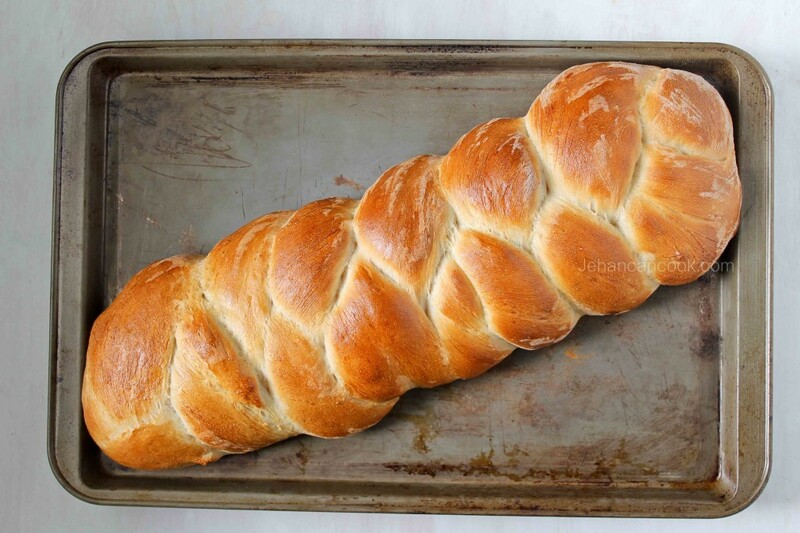 I bake bread a few times a month, and my 11 year old daughter is learning about yeast in school right now, and told me that she wanted to make a braided loaf for her teacher!! So we are making this bread now!! Thankfully I have a kitchenaid stand mixer to do the kneading!! Great Stephanie, please let me know how it turns out. Nandane, you can easily add whole wheat flour. I would recommend using half whole wheat and half regular flour for the best flavor. Sorry about that. “Salara” that stupid auto correct. Made the bread. Love it. I’m going to make this but I need it to be round like the pic on Facebook. Any tips on how to get it that way? Hi Lynn, here’s an excellent tutorial on how to make it round. I baked it in a 9 inch greased cake pan to maintain the shape. Love your blog, I was wondering if you have a recipe for tennis-roll??!! Or is it the same with some spices? Alina, I’m working on a tennis roll recipe. Love this recipe! And love your blog! I tried it yesterday and the bread was gone in a couple hours so had to make some more again last night. Can I double up on the ingredients to make a couple loaves? Thanks! You can absolutely double it. I’m glad you enjoyed it. Is the egg wash supposed to be 1tsp of water or 1 tbsp? I just feel like mine came out a bit darker than anticipated. It could be that I put too much on it as well. Monique it’ 1 teaspoon of water. Did you bake the bread on the top rack? If its too high in the oven the top can brown too quickly, it’s best to bake in the middle rack. I might’ve had it on the top rack… Can I just use butter? I’m allergic to eggs so, I tried the full recipe for my first one, it came out great! I just want to have a lighter top. Wow! This is just what my Mum used to bake. We would sit with glasses of milk waiting for it to come out of the oven and spread butter then enjoyed. My 1st batch, EXCELLENT!! A little too sweet for me now. I tried with less sugar, PERFECT. a nice brown. I like making home made bread to avoid the the unhealthy ingredients .This receipe has become my favorite.I will make a few for Christmas for my family and friends. Aliya, I add the yeast to all of the liquid. Thank You For This Awsome Bread Recipe. I Find It To Be Fool Proof. I Will NotCall Myself A Baker At The Least, My Sister Does All Baking For The Holidays, However This Year She Has A Newborn So I Needed To Get It Done. I Used Both Your Fruit Cake And Brea Recipe. The Both Came Out Well, I Am Making A Second Batch Of Bread Right Now, We Still Have Pepperpot And Is Out Of Bread. I Am Looking Forward To Trying Other Recipes. Thanks Again. I mind this today and it came out perfectly. I didn’t make a big one but i will be making more tomorrow. It’s so moist and delicious, my kids and I eat almost have of it 10 minutes after it got out the oven. Thank you! I had love this bread since I was going to high school. Thanks to the internet, I never knew I would be lucky to actually get it’s recipe, as I thought the bakery’s will forever keeps it a secret. Thanks for publishing it. I will definetly invest on the required equipment for my kitchen. I love this bread so much that I could eat it without any butter !!!! this looks soooooo inviting …reminds me when I had bread in Guyana with pepperpot…..just a quick question…..i’m having a problem with the yeast amount….how much tablespoon or teaspoon is equal to one oz please or how many packets do I use….I have 1/4 ozs of packets of yeast so do I use 4 packets because it seems like a lot…..please advice me how to measure the yeast correctly….thank u…I definitely want to make this for my husband..
Hi Miranda, one tablespoon is equal to 0.5 oz, so I would use two 1/4 oz packages. I made this bread, it was delicious, Will be making again tomorrow. Thank you for sharing! My first time making bread,was awesome. Couldn’t resist the looks of yours. Very soft and rich! But ,I add some milk and lessen the water. Thank you so much …. Keep the fantasic recipes coming 🙂 Happy Holiday’s …. Do have any bake/rost lamb recipe? Priya, I glad you enjoyed it! No I don’t have a recipe for lamb. Hi jehan i have tried a lot of your Recipes and the all came out so food…thanks for Sharing…do u have the recipe for Whole Wheat Bread? Simeone, simply replace the flour with whole wheat flour. Hi Jehan, quick question for you.. if you use a dough hook attachment on a mixer to knead the dough, how long should you knead it for? Is it the same 5 – 10 mins? Pamela its a meausuring cup that measures 8 ounces. 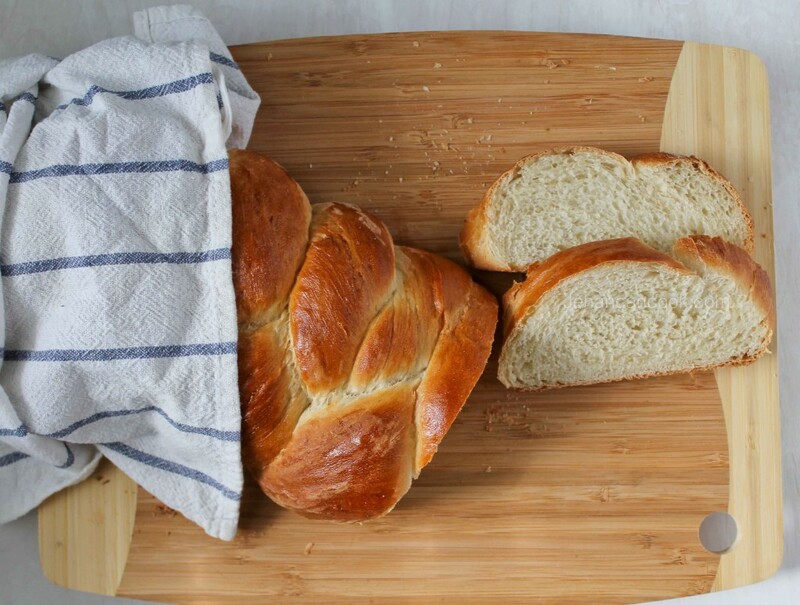 As a novice baker I found your plait bread very helpful – the bread turned out perfectly! Thank you soooo much for your Guyana bread recipe! I’ve never attempted bread before and this turned out perfectly. My family devoured a whole loaf with some tea in one sitting. Guess I’ll need to double the recipe next time! I tried your recipe and my bread was so soft. Thanks a bunch!!! After trying many bread recipes, I came across this one. Our Guyanese bread, I love it!! Excellent recipe for the Guyanese plait bread- turned out perfect. Will be trying the tennis roll next. Can I use instant yeast? And will it be the same amount? Farina, you can and yes it will be the same amount. This bread recipe is absolutely amazing. I have been making it every year for Christmas for the past 2 years. I goes well with my sister’s pepper pot dish. My nephew loves it so much he can literally just sit and eat that bread without anything on it. I never buy bread from the store anymore. Thank you so much for sharing. That’s good to hear Devita. Thank you for your feedback. Hi Jehang love your recipes. Great job keep.